0	0	Song Of The Nightingale	In Stock - Order before 4pm for same day dispatchWant it on Wednesday 24 April? Want to read of empowering faith? An inspirational and challenging true story of one woman's faith, so strong it could not be broken even in the face of imprisonment and torture. Song of the Nightingale is the true story of Helen Berhane, held captive for over two years in appalling conditions in her native Eritrea. Her crime? Sharing her faith in Jesus, and refusing, even though horrendously tortured, to deny him. A sobering, painful, heart-rending account of true faith in the face of evil, this book makes for uncomfortable and yet inspirational reading. Helen says, 'I want to give a message to those of you who are Christians and live in the free world: You must not take your freedom for granted. If I could sing in prison, imagine what you can do for God's glory with your freedom.' A real challenge for the church in the West. Song Of The Nightingale by Helen Berhane was published by Authentic in September 2009 and is our 13882nd best seller. The ISBN for Song Of The Nightingale is 9781850788645. 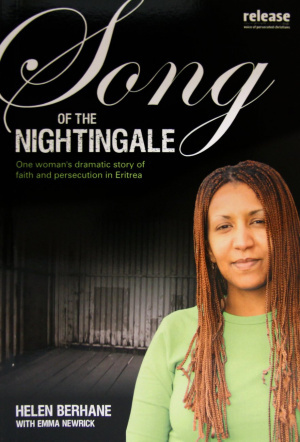 Song of the Nightingale is the story of Helen Berhane, a young Eritrean singer held captive because she refused to deny she was a Christian. Helen was arrested for preaching and singing on the steps of the large Catholic Church in Asmara, the capital of Eritrea. She was accused of anti-state activities and without trial was put into in a number of prisons, where the conditions under which she was held were dreadful and she was subjected to ferocious beatings and other ordeals. At no time did she deny her God and eventually she was helped to escape, firstly to the Sudan and then on to Denmark. Helen Berhane's story is told simply, without rancour, and is an example of true faith. Got a question? No problem! Just click here to ask us about Song Of The Nightingale.